After a rousing victory over Thomas Berdych, where, having won the first two sets, Berdych pulled back to level the match but using the crowd to lift him, Monfils found the inspiration to break Berdych and win in the fifth. Two days later, Monfils dropped the first set against Gulbis but went on to win in four. 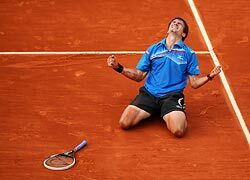 Today, the delightfully entertaining Monfils came up against Tommy Robredo, an experienced and talented Spanish player, who, like Monfils, has also had his day in the top ten and is at home on the clay. Again Monfils was inspired in winning the first two sets but, tiring, he dropped the next two. 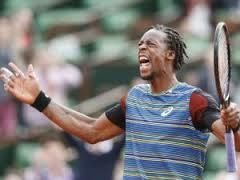 This time there was no reprieve for the clearly drained Monfils. Despite having match points and serving for the match at 5-4 in the fourth, the tenacious Robredo broke serve and leveled the match. Despite a return to form for Monfils in the run up to Roland Garros, winning a challenger and being runner up in Nice, spending most of the last year out with injury is no preparation for a series of best of five sets and Monfils eventually ran out of steam, dropping the fifth 6-2. “I have to give him credit because I think I wasn’t shy,” said Monfils. “I went for my shots. I missed maybe some, but some he played good points. It was very close. And when you lose a match, you’re not happy. But you can always find something positive in the match. The 31 year old Robredo is no spring chicken himself and has been on something of a comeback march, rising from 114 at the start of the year to 34 currently. However, an advantage he clearly had over Monfils was fitness, or endurance. While Monfils was visibly struggling during the final set, Robredo was able to take advantage. The physically better prepared Robredo held firm. 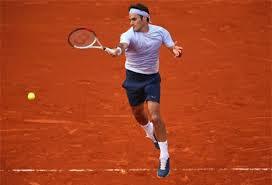 Are banks like the club hacker when they should be more like Federer? French Open day four and another sublime performance from Federer, dispatching Somdev Devverman for the loss of just four games. Federer was in no mood to hang about, breaking Devvernan in the first game, though Federer, in going for his shots was also making unforced errors. With many of his points coming from Federer’s mistakes, it is tempting to liken the Indian to the professional game’s equivalent of the club hacker, though probably unfair. For those who play tennis, facing the club hacker can be something of a nightmare. He or she is the one who runs everything down, aiming just to get the ball back into play – they seem to make few mistakes, mainly because they don’t take risks, frustrating many a seemingly better player into making mistakes. The COO of a major investment bank a few years ago likened many of his directors to club hackers – in the cultural environment they were in they were frightened of making mistakes and therefore of taking risks. Of course the environment has got progressively worse, with increased regulatory pressure and continual rounds of cost cutting, the fear of raising one’s head above the parapet is common in many large firms. Unfortunately banking is about taking risks but not only are many frightened of any risk, accompanying this is an increased unwillingness to take ownership for results or deliverables. Such environments do not foster growth, in contrast Federer, particularly among the top players, gets the results, accompanied by more errors than the other members of the top four, because he takes risks. Who’s in your support team? Playing the context – should we be surprised by the number of upsets? Rafa continues to demonstrate that experience delivers ….